Look to us for industrial process, electro-pneumatic, explosion proof transducers with extensive combinations of inputs and outputs. We specialize in fast response transducers, high flow transducers and high accuracy transducers developed by top manufacturers like Fairchild Industrial Products. 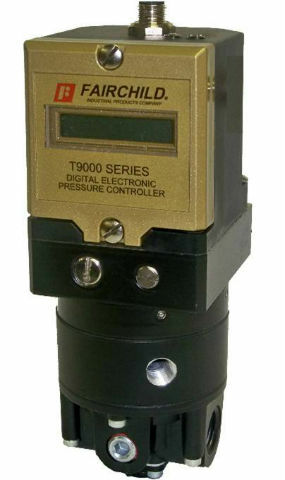 High Accuracy Electro-Pneumatic Transducers - a complete range of high performance transducers for every application: includes the compact E/P, I/P T7800 series with Piezoelectric actuator and the new T9000 Electro-Pneumatic Pressure Controller with a closed-loop integrated, microprocessor control system. Explosion Proof Transducers - For applications with natural gas media and others which require reliable and accurate explosion proof transducers which carry all FM, CSA, ATEX and IECEx agency approvals for years of worry free operation. Additionally, the TX18750 incorporates patented technology to provide a moisture resistant I/P unit. Whether you demand high accuracy, high pressure, high flow, fast response or "all of the above", we carry a complete line of precision, high performance transducers from Fairchild to suit your application and handle your toughest challenges.